Dr. Richard J. Baron, American Board of Internal Medicine President and CEO, and Dr. Clarence Braddock, Chair of the ABIM Board of Directors, both bring years of experience to their roles at ABIM. They collaborated on a recent Perspectives article in the New England Journal of Medicine, which shares the story of ABIM’s transformation to support physicians as they strive to stay current and to deliver a credential that continues to live up to the expectation of excellence inherent in our profession. 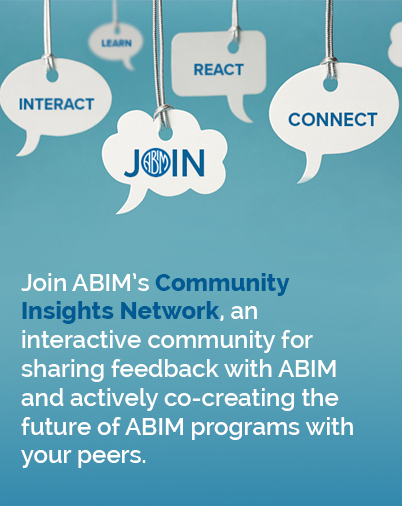 The article provides some history and context about the credential and details 20 months of profound change at ABIM, all of which has only been possible through physician input. View the Perspectives article on New England Journal of Medicine’s website. Dr. Clarence Braddock, a board certified internist, is Vice Dean for Education in the David Geffen School of Medicine at the University of California, Los Angeles. He is also Chief Medical Education Officer for UCLA Health, and holds the Maxine and Eugene Rosenfeld Chair in Medical Education. He is Chair of the Board of Directors of the American Board of Internal Medicine, and Chair of the Executive Compensation Committee. Dr. Richard Baron, board certified in Internal Medicine and Geriatric Medicine, is President and Chief Executive Officer of the American Board of Internal Medicine and the ABIM Foundation. He was a former Chair of the American Board of Internal Medicine’s Board of Directors and served on the ABIM Foundation Board of Trustees. He practiced medicine for 30 years in his Philadelphia community.